Five years ago when I began looking for a dog I knew I had found the right one when I found Chloe. She was adorable, energetic, and best of all cross-eyed. Chloe seemed to be the perfect dog. However, I was unaware of the many vet trips we would take over the next few years. Chloe’s first trip to the vet occurred only four months after her coming into my home. To my surprise when I got home from school Chloe had several puke piles around the house, and her stomach was so bloated she looked like a doggy balloon. Knowing something was definitely wrong I grabbed Chloe, lifted her into the car, and drove her straight to the emergency vet. Although it was clear she was in pain, she laid on the vet office floor looked up at me with her beautiful eyes and wagged her tail. It was that moment that I knew I would do whatever it takes to save her. After a brief examination the vet informed me that Chloe had a gastric torsion. Essentially she had gotten sick, and started puking so heavily that her stomach twisted. Chloe had to have emergency surgery. After Chloe recovered from her surgery she seemed to have little to no problems. Over the next couple of years she was a really happy dog. She loved running, swimming, and playing with other dogs. I did however have some small concerns about Chloe’s overall health. She had occasional diarrhea, a stomach rash, and she always had trouble putting on weight. Being the overprotective mom I am, I called the vet with questions at every slight chance of illness, and I brought Chloe in for all of her routine check ups. When I mentioned my concerns to the vet he had reasonable explanations for every problem. Her rash was from her surgery, her weight was her breed, and the diarrhea he felt could be worms. He gave me medication for the worms and told me to call with any other concerns. Over the next few years Chloe’s health was about standard. She occasionally had some joint pain but other than that she was fine. It wasn’t until last year that I realized something was seriously wrong with Chloe. Over the last year my husband and I had noticed her mood, and energy starting to rapidly decrease. We just assumed it was her age. We knew she was about 5, and that large breed dogs typically didn’t live long. Then we noticed every morning Chloe’s dog bed would be soaking wet with urine. We took her to the vet and without running any tests he let us know that she was going through a hormonal imbalance, and he gave us some medication to give her and sent us on our way. For a while after the vet visit, everything seemed to be going fine. Chloe would still occasionally wet the bed, and her mood was still decreasing, but we just figured it was something we would have to deal with. Then about two months ago my husband and I noticed a rapid change in Chloe’s physical appearance and mood. She was extremely thin, she wouldn’t eat, and she was so fatigued she could barely get off the couch. After watching her for a few days we took her back into the vet for some answers. The vet examined Chloe and expressed his extreme concerns for her health. He said she seemed anemic. She had developed small skin tumors, she was lethargic, and he was concerned about internal tumors. He drew her blood, gave her a cortisone shot, and sent us home with steroids. The next day he diagnosed Chloe with an autoimmune disease, and told us to prepare for the worst. He let us know that her mood might get better with the steroids, but we could be in for a long road ahead and that it was quite possible her time was up. Now to most Celiac patients, Chloe’s symptoms probably sound familiar. She had diarrhea, a rash, she was skinny, lethargic, bladder problems, and now an autoimmune disease. Not knowing any better I figured she was just a dog who had health issues, and I prayed that she would get better. I expressed my concerns for Chloe with Nadine and she recommended I put her on a gluten free diet. She pointed out the similarities between Chloe’s illnesses and celiac disease, and finally made a connection I couldn’t. Chloe has been off of her steroids and gluten free for over one month now and she has more energy than she knows what to do with. We no longer have bed wetting problems, her energy is back, her coat is shinier, and for the first time in a year she wants to go for runs and play with other dogs. Gluten intolerance and celiac disease have been proven to be prevalent in canines. Unfortunately due to the wide variety in symptoms, it is not something that veterinarians often recognize. Luckily there are great resources on the web for information involving pets and gluten intolerance. Below we have attached some fantastic articles that will help you decide if a gluten free diet is right for your animal. When deciding to put your dog on a gluten free diet, please consider the cross contamination issues that come into play with keeping gluten filled dog food in your home. 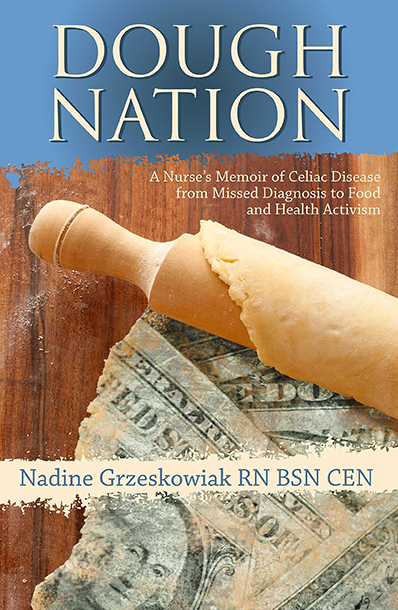 It only takes a single breadcrumb to trigger an autoimmune reaction in a celiac patient. If you decide to keep your dog on a gluten diet consider wearing gloves, or washing your hands after feeding them. Here at the office all of our dogs have gone gluten free. We have tested several different “grain free” dog foods, and unfortunately most of them do not test 100% free of gluten. The only food that has past the test is Natural Balance, LID. This is a great dog food that can be bought at most pet supply stores. It has a limited amount of ingredients, and comes in several different varieties. Remember when switching your pet to a different food to always slowly switch them over because their stomachs cannot handle a rapid change in foods.